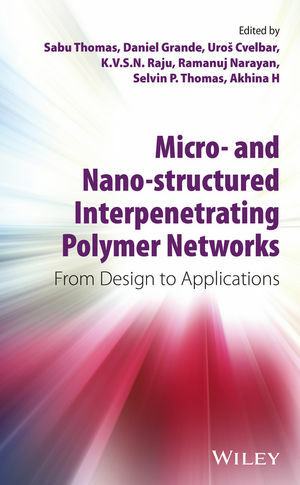 This book examines the current state of the art, new challenges, opportunities, and applications of IPNs. With contributions from experts across the globe, this survey is an outstanding resource reference for anyone involved in the field of polymer materials design for advanced technologies. Prof. Dr. Sabu Thomas teaches at Mahatma Gandhi University's School of Chemical Sciences and International and Inter University Centre for Nanoscience and Nanotechnology. Dr. Daniel Grande is a CNRS senior researcher based at the East-Paris Institute of Chemistry and Materials Science belonging to both CNRS and the "Université Paris-Est Créteil." Dr. Uros Cvelbar is a researcher at Slovenia's Jozef Stefan Institute. Dr. K.V.S.N. Raju and Dr. Ramanuj Narayan are scientists working with the Indian Institute of Chemical Technology's Polymers and Functional Materials Division. Dr. Selvin P. Thomas iis an assistant professor in Chemical Engineering in the Yanbu Research Center of the Royal Commission for Yanbu Colleges and Institutes (RCYCI). Akhina H is a senior research fellow(CSIR) at International and Inter University Centre for Nanoscience and Nanotechnology at Mahatma Gandhi University.